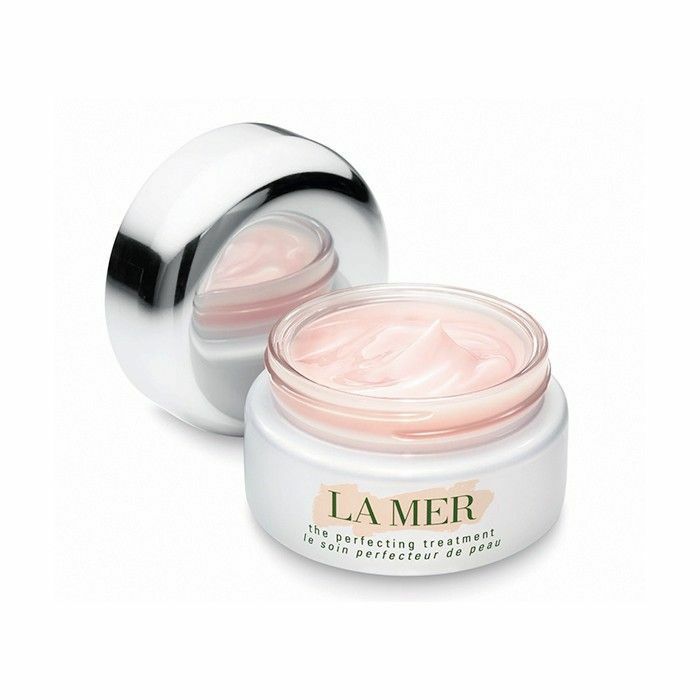 So when La Mer's new Perfecting Treatment ($240) came across my desk, suffice to say, I was pumped. Truth be told, my initial thought was, Wow, this is heavy! It not only feels like an expensive face cream, it also looks and smells like one too. The pink-hued cream is an unexpected choice for the brand's renowned white formulas, but one that intrigued me nonetheless. I couldn't wait to apply it before bed that night and witness the La Mer magic before me eyes. After washing my face and swiping on a bit of toner, I dipped my fingers into the smooth pink cream. Its consistency is similar to a hydrogel, and it doesn't have the slightest greasy feeling. I was amazed at how fast it absorbed into my skin and noticed within seconds that my skin was radiating. I'd felt like I'd just gotten a facial at a five-star spa. The next morning, my skin was still insanely soft and glowing. I washed up as usual and applied a new, fresh layer of the treatment and found that it was actually working with my foundation to create a dewy finish. Had I hit the moisturizer jackpot? I think so. Senior editor Hallie Gould agrees. Says Gould, "It blurs and softens any flaws while also actually improving your skin—so it's very literally skincare as makeup. It makes your foundation glide on like porcelain in a way that I've never experienced before. Basically, this product is like the fanciest, most effectively helpful primer my skin has ever seen." Now please excuse us while we apply it to our entire bodies. What's your favorite face cream? Tell us below!